Last February, Michael Tse (謝天華) and wife Tina Lee (李天恩) welcomed their first son Theo Tse (謝浩飛). 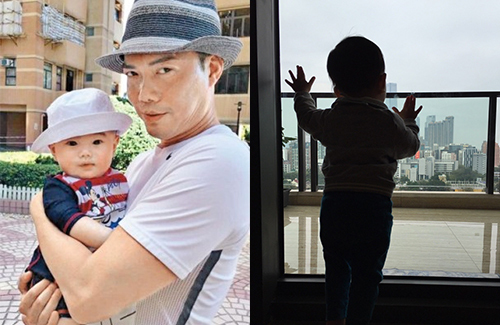 On Wednesday (February 3), the “Laughing Gor” star shared a candid photo of his adorable little boy standing up, leaning on the glass door of their balcony. Michael and Tina were together for over ten years before they decided to tie the knot in 2005. The couple met when Michael was still a singer under the Rock Records label, and Tina was one of the label’s music producers. The couple revealed in September 2014 that they were expecting Theo, who was conceived through artificial insemination. Theo was born via cesarean section on February 3, 2015. Omg, he’s soooooo…cute…. lol….wonder how the wife looks like? this is one cute little guy. laughing 仔. Happy for him and his wife. Kid is really cute. What a cute little toddler. I pray he grows up happy, healthy, loved and smart.